On April 30th, IBI’s Kelpie Wilson and I attended an energy fair at Heritage High School in Vancouver, Washington. For the past few months, Kelpie and I have been helping teachers and students at the school learn about biochar. Teacher Darlyn Wendlandt started the program last year when a friend told her about biochar. She knew that the kids do best with hands-on learning, so she searched the Internet for an appropriate project. She found Kelpie’s presentation on her backyard biochar retort-kiln and was especially interested in the pizza oven Kelpie had incorporated in the top of the kiln. 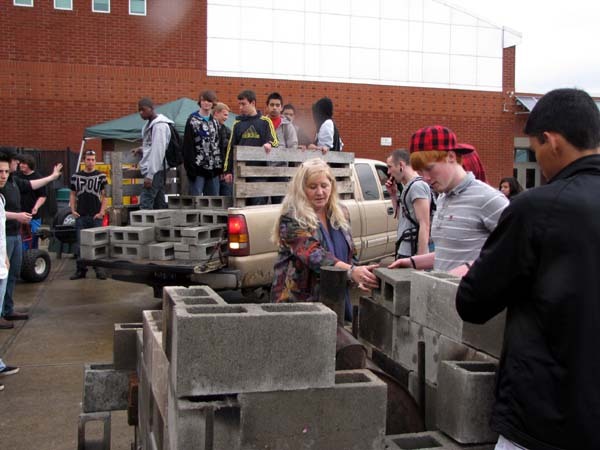 School rules prohibit open fires on school property, so she brought a group of students to her own backyard where they built and fired the retort-kiln last fall. 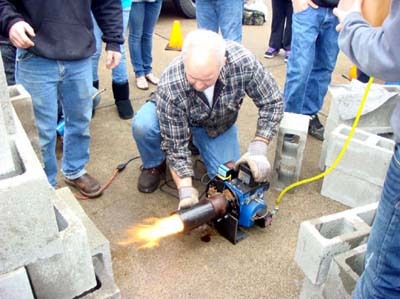 But when the students wanted to demonstrate the project at school for the annual energy fair, they had to find an alternative to wood for firing the kiln. Darlyn Wendlandt and shop teacher Jim Neiman, whose welding class fabricated the retort, saw the problem as an opportunity to demonstrate one more way that biochar could be integrated with other school projects in renewable energy. They would try using biodiesel to fire the kiln. Several of the schools in the district have achieved high levels of energy and resource conservation. At Heritage High School students have been making biodiesel from cafeteria grease and they want to make biochar from non-recyclable paper waste from the cafeteria and use it in a community garden they are building on the school grounds. They are pioneers in combining biochar with biodiesel, waste management and agriculture so they all work together. The Energy Fair display included the biodiesel processor, a biodiesel powered Go-Cart, solar panels on the school, a solar boat race, and solar cookers. We found the fair to be a fun learning experience. Students in or between classes and at lunch would wander out to look at the exhibits, ask questions, and make comments. I heard many very perceptive comments and suggestions. I thought the teachers and principal at the school used a couple of great gimmicks to spice up the display: cookies and cops. Cookies. Student had incorporated Kelpie’s “pizza oven” feature in the kiln so they could make cookies while the retort was heating, otherwise it’s a little boring just watching the retort. Each batch of cookies that came out was greeted with enthusiasm. Cops. 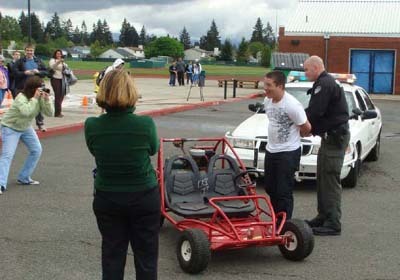 With dozens of students looking on, the school principal went for a ride in the biodiesel Go-Cart that was driven by one of the students. They disappeared out of view around the school. As they returned to the exhibit area they were followed by a squad car with lights flashing and sirens screaming. The cart was stopped and the driver was “arrested”, cuffed, and taken off in the squad car. The cameras came out and the students thought that was the highlight of the day. Unfortunately, while the kiln did a good job on the cookies, the biodiesel burner, even with backup from a propane heater, was not able to pyrolyize the waste paper and cardboard in the retort. We need to do some basic engineering on the kilns. Since the heating value of biodiesel is about 118,000 Btu/gal and the burner would have been using about 1 gph, then the heat input was only about 100,000 Btuh, the same as the propane heater. So we had a total of 150,000-200,000 Btuh available. Heat transfer from the burner would have been better because it has a luminous, radiant flame. The surface temperature of the barrel only got up to about 300F. Heat losses including the cold bricks, the open vents, etc. would have been large. If we had a wood fire under the kiln we might have burned about 50 lb of wood to start gassing in half hour: 50 lb x 7,000 Btu/lb = 350,000 Btu/.5 hr = 700,000 Btuh. The numbers might be wrong but the concept is correct – we needed more intense heat to start gassing. 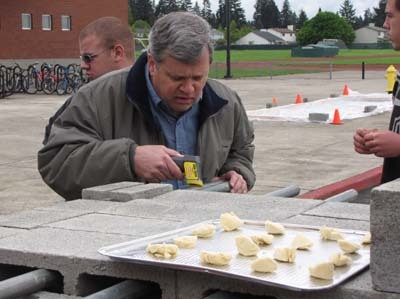 Tom Miles is the principal at T R Miles Technical Consultants, Inc. in Portland, Oregon. Tom has 30 years of experience in the development, design and installation of biomass energy systems, agricultural systems, air quality and waste management systems, and international development projects. Tom is the founder of the Bioenergy discussion lists at Bioenergylists.org and he initiated the biochar discussion lists now hosted at http://tech.groups.yahoo.com/group/biochar/.